Are you looking for a dream wedding aboard a luxury yacht? Are you looking for a romantic and unique wedding venue in the most incredible city in the world? Are you looking for an affordable wedding that will have the menu options and amenities you need? Then you need to book your special day with Skyline Cruises. Our luxury yacht, the Skyline Princess, offers a unique and spectacular setting for the happiest day of your life. But we know that every wedding is different, so we want to tell you about the various alternatives you can have with Skyline Cruises. The Skyline Princess isn’t just a great wedding venue. We hold all types of events from family gatherings such as birthdays including Sweet Sixteens or quinceañera celebrations. We host corporate and non-profit events for all types of organizations. Whether you’re celebrating a retirement, entertaining clients, holding a charity auction or just want to reward employees for a job well done, the Skyline Princess is the place to do it. The Skyline Princess is a 3-deck luxury yacht that can accommodate weddings large and small. We are Coast Guard certified to hold up to 450 guests. You can have your ceremony on board if you choose, as many of our guests choose to have a wedding at sea officiated by our longtime friend Captain Arnold. The lower decks of the Skyline Princess can be used for a cocktail party as well as a reception area. And Skyline has plenty of menu options. Our food is prepared by our in-house chef and we can create anything from a modern cocktail reception to a formal banquet. Our cocktail reception party allows you to choose six out of nearly two dozen hors d’oeuvres. You’ll also enjoy Skyline’s bistro table of fruits and vegetables, cheeses, flatbreads and antipasto platters. Plus, two pasta stations from a choice of nine different pasta dishes! There are also two carving stations and you can choose one specialty station such as Asian or Mexican. Other packages allow you to choose three out of our 18 entrees and two out of eleven side dishes. Talk to our event planners to see what you want. The top deck of the Skyline Princess is for partying! And you can plan your wedding cruise for any season. The ship is climate controlled and our top deck, also called the skylight deck can be open air or left enclosed. The skylight deck comes equipped with a dance floor and a DJ space. We’ll also provide you with a bridal suite on board the Skyline Princess. You’ll see iconic sights like the Empire State Building, Brooklyn Bridge and United Nations. 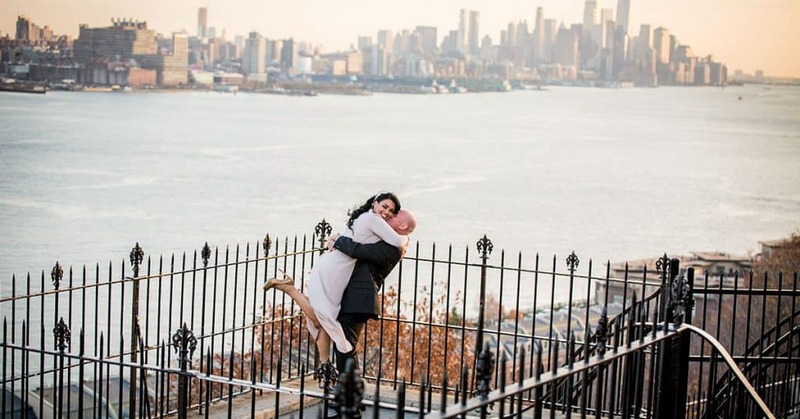 And what could be more romantic than wedding photos in front of the Statue of Liberty? Skyline helps plan weddings for groups of all sizes. You can do a full ship charter of the Skyline Princess from our home port located at the World’s Fair Marina in Flushing, Queens. Full ship charters also leave from other ports around the metropolitan area in Westchester, New Jersey, Manhattan, Connecticut and elsewhere on Long Island. If you’re looking for a smaller wedding, you can rent a private deck on one of our public cruises which leave from Flushing. Some of our most successful weddings are small events which involve just a table or two. Talk to our event planners and we’ll help you plan. You will find the best alternative is aboard a Skyline Cruise. Contact us and start planning your wedding cruise today!